Notifications in ESP are able to be managed in the ESP Admin area. 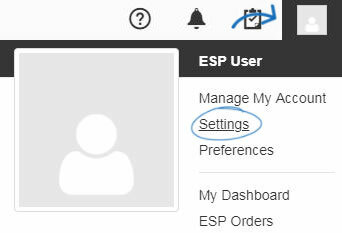 To access the ESP Admin, click on your avatar and then click on the Settings link. Email notifications will be sent to the email address within your ESP account. In-App notifications will appear via the bell icon. Use the Details dropdown to view individual options for the section. Note: Clicking on the slider under Email or In-App will turn off all notifications in that section. For example, to disable all In-App notifications, click on the slider so that it displays "No".